Are you Seeking a Path of Enlightenment, Self-Realization and Conscious Evolution? The DNAvatar™ program emanates from many different projects co-created by Gary & JoAnn Chambers, also known as ShapeshifterDNA. Their multidimensional QSET™ music, which is the core teaching of this program, is available at the Visionary Music & Multimedia website. You can listen to most of their soundscapes at their virtual sound temple on YouTube, called the Temple of the Divine MUSE (TDM). The DNAvatar Program contains the teachings that have emanated from deep immersion into their vast Sonic Mystery School. All the courses here are based on over 30+ years of research, personal experience and engagement with many thousands of seekers all over the planet who have already explored their soundscapes through their DNA Activation series. The key element of the DNAvatar program are the soundscapes and this is where the real teachings will eventually be found, via frequency based transmissions of higher knowledge and wisdom. Each course will teach you many concepts, theories and techniques so that you can understand how to engage more deeply and directly with the informational content found within the sonic transmissions. Many experiential exercises are offered to help you learn how to engage more deeply with this form of attaining guidance by connecting to the many dimensional levels of Source Vibration. This is an ideal program for those who follow a self-directed path of enlightenment, self-realization and understand the importance of engaging in Conscious Evolution during this timeline in humanity’s history. Are you Ready to be a DNAvatar? Gary started his explorations into the multidimensional realms of Sound at the age of 5 by maintaining his deep connection to Source Vibration through his ability to play along with the music he was hearing within; what some refer to as the Music of the Spheres. He is a sound designer, keyboard synthesist and composer with advanced clairaudient abilities in receiving downloads of higher frequency-based transmissions. To understand this on another level, consider anyone who says they speak with God, masters, deities, fairies, angels – for them they translate this communications into words, Gary translates these connections into sound patterns/music. Through lifetimes of training, he arrived in this incarnation with one purpose, one focus, which is to bring through the sonic frequency maps that will assist humanity in navigating through the evolutionary waves of our expanding consciousness. The multidimensional frequencies within the soundscapes he creates release the codes within our individual and collective DNA which activate the shapeshifting process of transformation and transmutation; gradually shifting us from our current 3D carbon based human form to a 5D body of light infused with the essence of the emerging evolved Universal Galactic Human. This process awakens the awareness of your sovereign empowerment on all levels and assists greatly in freeing you from the control structure matrix. However you experience these limitations, know that many are in place for your safety as an evolving Soul on a journey towards Enlightenment. Awakening gradually, yet consistently, is the primary goal of this program and we are here to help you navigate the awakening process as it is unique to you. There are many steps and stages along the way and we can help you to understand the greater important of each phase. In 1986, Gary released Healing, his first album in this evolutionary genre he now calls QSET™ (Quantum Sonic Empowerment Transmissions). This was his initial reaching out into the multi-verse to see if connections could be made through the DNA communication network. He sent out a frequency based message that it was time to begin activating the higher DNA strands in those ready to awaken on the planet. JoAnn, his wife, responded to that calling in 1987 after seeing Gary in concert and then experiencing a profound activation by listening to the Healing soundscape. They have been together ever since. It was clear that both their previous studies and life experiences had prepared them for this twin flame reunion and that it was time to fully commit to their spiritual path and to begin grounding these teachings into tangible actions on the Earth grid. In 1989 they created a high end sound healing room (Odyssey Sound & Light Temple) connected to Gary’s studio and this was the official start of their research and their personal deeper work with DNA Activation. JoAnn has had a private practice focused on psychophysical bodywork, massage, shamanic sound healing and spiritual guidance since 1985. By combining their various gifts and talents they started their initial research of using sound to activate the dormant DNA codex which lasted approximately 10 years (1989-2000). They combined their work and assisted hundreds of clients to activate their DNA during the evolutionary waves of higher frequencies that were streaming on the planet after the mass awakenings following the Harmonic Convergence in August 1987. These were the beginning days of the conscious evolution generation and many amazing lightworkers were starting to show up to begin anchoring in all types of advanced concepts of what it is to be a spiritual being inhabiting a physical form. In early 2000, they released the results of their 10 years of research in the form of the DNA Activation LevelOne series which consisted of 4 CD soundscapes and a book. During the next 14 years, they expanded their knowledge about the full scope of this work based on more feedback from clients and specifically their own deep immersion in the DNA Activation process. At this writing (Mar 2019), they have 25 soundscapes, 5 books and 2 DVDs plus numerous support items like podcasts, webinars and interviews. Tens of thousands have engaged with and supported the on-going development of this work, with several 100,000 downloads all across the internet via YouTube, file sharing and torrents. They openly share their knowledge and wisdom from the perspective of a student and a teacher, as they know there are so many layers of unfolding that occurs throughout the journey that one can never really grasp the full scope of this ongoing adventure. 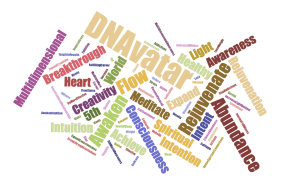 The DNAvatar concept was first launched in August of 2010 and since then they allowed the energies of what it was to become to formulate into what you are now seeing offered here on this site. The first level teachings were presented in the form of 2 DVDs, which are no longer available but will be integrated into these courses. If you have always felt that you are here to access more of your potentials and you want to share your Light with the world in some way that feels in alignment with your higher path, then we invite you to step inside our magical Sonic Mystery School and engage on a wondrous adventure that will continually expand for the rest of your life. Learn more about what a DNAvatar is and how you become one yourself. A personal note . . . . If you are new to our work or not sure where you can go with what you already have, then the DNAvatar program is the best place to begin. We will begin with the basics and build upon that over time. We will incorporate the most important aspects of our body of work over the last several decades into these course in the DNAvatar Program. All of the soundscapes that are currently in our catalog will gradually weave its way into this DNAvatar adventure. We will take you through the journey of working with these evolutionary concepts using multidimensional sound to awaken, activate and ultimately ground various higher teachings into practical life experiences. We will walk you through the process step by step, allowing the space for your higher consciousness to take the necessary leaps when it is time. Regular listening to the music prepares your bio-energetic field to accumulate and assimilate the incoming waves of expanded frequency spectrums, so that when it is time to take each next leap, you will have a solid foundation behind you as support. We feel it is important that you know who we are and what our motivations and intentions are behind offering you these teachings. For us, this is a lifetime journey of self discovery of not only our personal higher potentials but that of all of humanity. We believe in openness, honesty and full transparency about our journey with this process as this will help the greater whole of humanity to evolve more quickly to the next level of our collective evolution. We will not give you hype or false promises that all will magically appear in your life without directed efforts on you part. This is the real work of transformation and the journey is not always an easy one. With our knowledge and wisdom gained, perhaps we can help smooth out some of the rough spots for you with our guidance. Please engage at whatever level feels right for you and know that we are here as you need us. We send you many blessings of divine sounds on your journeys.